Life is full of challenges and opportunities. However, to unearth such opportunities and to be capable of facing the challenges of dynamic global environment, one needs to think creatively and innovatively. Technical & Management education at AIT surely fosters professional, intellectual, and personal development that helps an individual to think in innovative and creative manner. Academic environment, intellectual capital, physical infrastructure, industry interface-placement, and career oriented education are some of the important dimensions of a professional institute. AIT is known for qualities in a very short span of time of 3 years of its inception. Students- the major stakeholders are always at the center of the institute’s management. At AIT, our faculty, industry experts, staff and students are committed to the institute’s core values and guiding principles. We uphold integrity, credibility and commitments in all our dealings. As new perspectives continue to emerge in the global environment, our course curriculum and electives are highly responsive and flexible, reflecting the problems and issues most relevant in today’s and tomorrow’s time. Our emphasis is on innovative learning which we achieve by unique teaching and value imparting style. It encompasses the conceptual inputs and hand-on approach in our teaching. We are looking for the students with the highest standards of integrity and respect for others, having personal responsibility, possessing an appetite for hard work, and who understand that learning at AIT is a privilege. With this, I invite you to experience the environment at AIT, that is a unique blend of traditions and modernity which helps in equipping the students to face challenging roles that the future offers. Aryan Institute of Technology has been established with a vision to impart quality education in the fields of engineering. The topmost priorities of this institute are to achieve excellence in academics, discipline and to ensure worthy placements to our students. The supportive management, energetic and dedicated team of faculty and staff members are putting their consistent efforts to attain the high standards set by the mission of the institute. Our goal is to enrich the in-depth subject knowledge of the students as well as to train them by giving practical exposure with the help of well equipped labs, industrial tours, seminars, industrial training and workshops. Wi-Fi/ net working campus and various scholarship schemes boost up the moral of the students and add an extra edge to the academic environment. Our aim is to produce excellent technocrats to serve global as well as domestic competitive market. 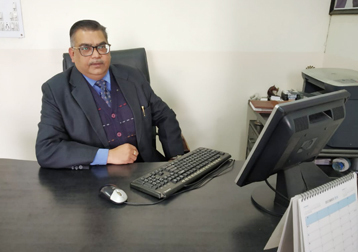 Director, Aryan Institute of Technology, Ghaziabad.